Aliso Viejo, Calif. – The fifth annual Crystal Apple Awards were held last Thursday (Mar. 22) at The Church of Jesus Christ of Latter-day Saints (LDS) in the Laguna Niguel Stake Center in Aliso Viejo. 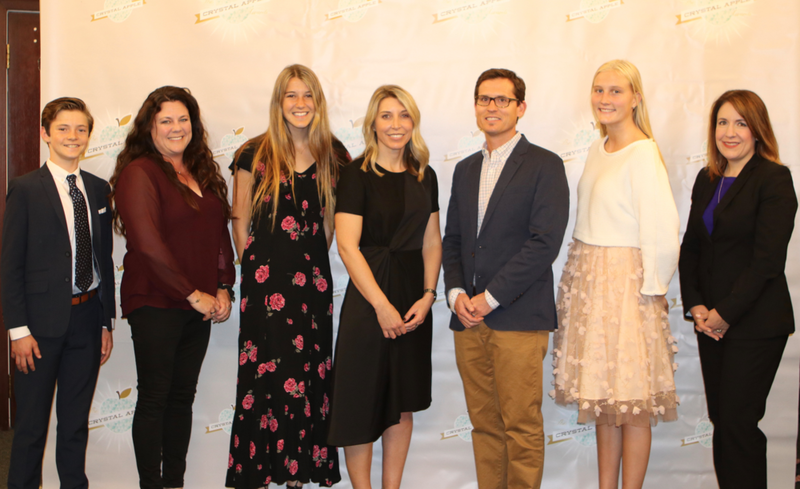 Community members, students, teachers, civic leaders and school leaders from Aliso Viejo, Dana Point, Laguna Beach, Laguna Hills and Laguna Niguel came together to celebrate eight teachers from four local high schools (Aliso Niguel, Dana Hills, Laguna Beach and Laguna Hills). 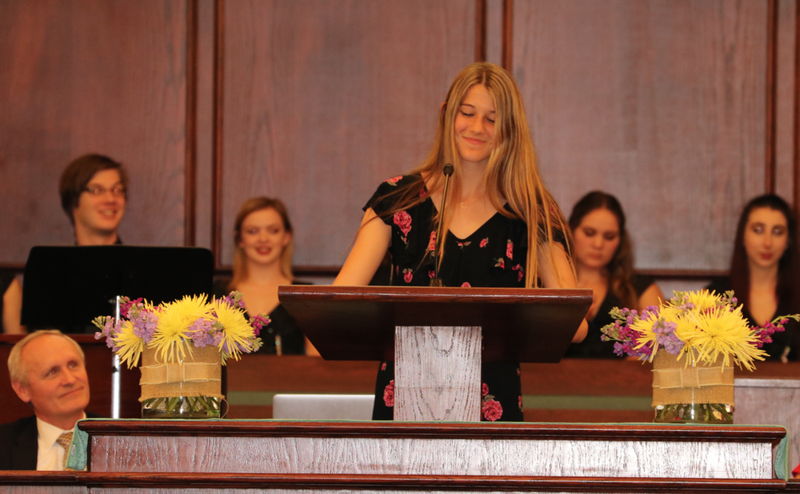 Students nominated teachers that inspire and motivate them, and from those nominations students were selected to present the award to the teacher. Recipients included Dan Bornfeld and Douglas Mack (Aliso Niguel), Jeri Garcia and Gail Stirtz (Dana Hills), Mark Alvarez and Lara Greco (Laguna Beach), Mary Belfield and Michelle Carmo (Laguna Hills). The students each conveyed the impact and meaning the teachers have on them and their daily student life. “She treats her students like family,” remarked student Teyo Jacobson with regards to teacher, Michelle Carmo. The feeling palpated throughout the room that these teachers are having a meaningful and lasting impact upon the students. “You can always count on him to have a solution to any problem,” reflected Weston Bowcutt regarding Douglas Mack. The educators, in turn, had the chance to say a few words when accepting the award. It was obvious to the audience, they held their students in high regard and love what they do. “I believe in them. They are the complete opposite of the millennial stereotype. They are brilliant, caring, creative and empathetic. I am not just their teacher, I am part of their village,” reflected teacher, Jeri Garcia. The evening ended with a heartfelt conferment of an Honorary Crystal Apple Award to the late Ray Woods (Dana Hills High School Choir Director), which was accepted on his family’s behalf by Nathan Langdon. Mr. Woods had been instrumental in having his Blue Lantern Vocal Jazz Ensemble perform at all of the previous Crystal Apple Awards. He was a dedicated musician and teacher and is missed greatly at Dana Hills High School. The Blue Lantern Vocal Jazz Ensemble, led by Ray Medina, capped off the program with their beautiful harmonies and renditions of two musical numbers. Guests mingled and enjoyed apple pie, following the program, with teachers congratulated and students inspired. Other guests included Leisa Winston (Laguna Beach Unified Assistant Superintendent), Jan Vickers (Laguna Beach Unified School Board President), Judy Bullockus and Gary Pritchard(Capistrano Unified Board of Trustees), Amanda Morrell (Saddleback Valley Unified School District President), Mel Carruth (Laguna Hills Mayor), Ross Chun (Aliso Viejo Mayor Pro Tem), Bills Hinds (Laguna Hills High School Principal), Deni Christensen (Aliso Niguel High School Principal), Dr. Joshua Porter (Dana Hills High School Principal) and Nikol King (Laguna Beach High School Assistant Principal).